Back in skis! 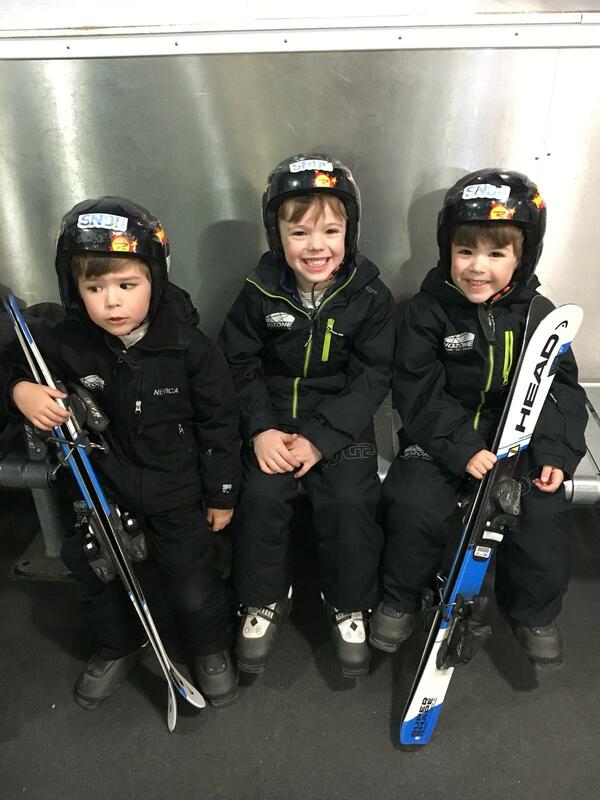 Our first lesson at Snozone! Three little under fives and I had a brilliant private lesson with Camelia. We had to arrive bright and early at 7:30 for our 8am lesson and with good reason. It took me almost that entire time to get my boots on!! Haha. I am SO inflexible. 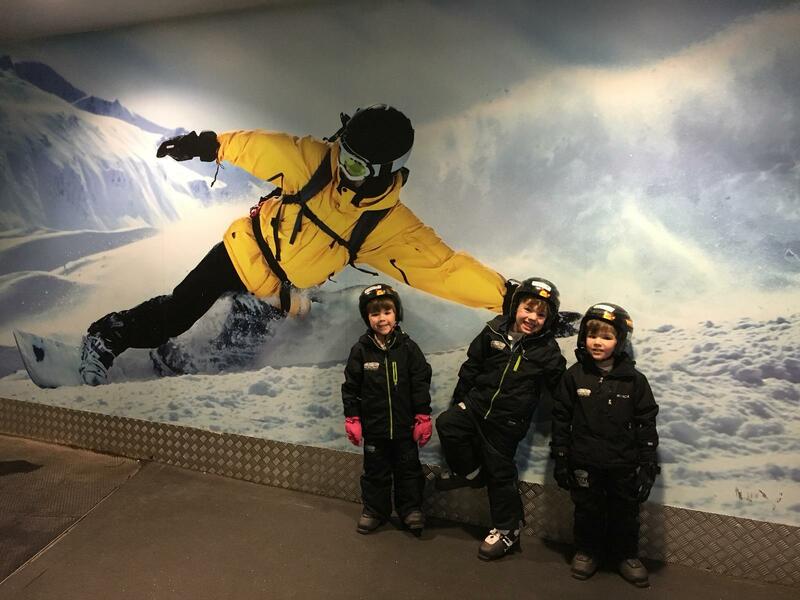 We were kitted up by the brilliant staff, fitted with our boots and skis, all adjusted to our height and weight - I have no idea what my weight is, she was mortified asking me and I just guessed at Big! Lol. Then with a little heaving and sucking (and a last minute breast feed) I managed to get myself ready for the slopes. I have to be honest I was expecting the kids to be awful - Bambi on ice - whingey and really hard work, but they were all actually amazing!! Camelia has the patience of a saint and the arm muscles of an elite sportswoman. She effortlessly pulled each one of the kids back to their feet even after the 28th crumple and didn’t even show a hint of frustration when my little lad couldn’t manage a snow plough for the life of him! (Can’t say I was quite as calm! I just couldn’t figure out why he couldn’t put the ends of his skis together 😂). As always Little Wiki was gung ho for it and wanted to run before he could walk. He skipped snow plough and went straight for parallel skiing although this meant he couldn’t stop, had zero control and generally needed to start from scratch with the learning. Much to his annoyance. Our instructor was great. She made it clear and simple and we all loved every second of it. I’d not been on a board or skis since pre kids and had no idea how I’d get on but I think I’d be able to get up some good speed with a few more hours on the slopes. I’m just so inflexible post kids, it’s madness! With a few more lessons the little ones would be amazing I can tell. 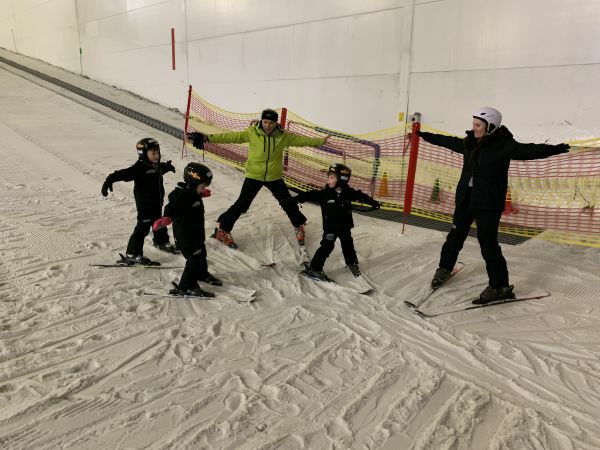 The twins got it straight away and managed a good snow plough and all the kids eventually got the hang of the lift after a few (reasonably amusing) stumbles. It’s definitely not a cheap hobby, but if you can do it then it makes total sense to get them started early. We watched the lesson of little ones Academy that went in after us and they were flying down and looked incredible. Little dots travelling down the slope at mega speed. Snozone run a camp throughout the summer for 7- 16 year olds of all abilities. And a half day camp for 3-6 year olds. Their summer lessons are also a little cheaper than their high season and means they are good to go for the winter slopes. You can also have a group or private lesson as adults and family lessons are available too. Proces are quite tricky to pull through here so see all details here. We absolutely loved it and would love to send the kids to regular sessions to get them used to it at a young age. I know Mr Wiki and I are gagging to go boarding again and we might try a lesson soon when his knee is better and I’ve saved up! It’s sadly not something we can fit in as a weekly activity but I would massively recommend it if you can. It’s soooo much more fun that the gym and provides an all over body work out in one hour, so if your membership is going to waste then do this! !